I think that is one of the hardest things - to stay active and planning/making healthy meals when you're so busy and stressed with other things. It's so easy to just order something in instead, but I always feel better when I keep eating healthy and balanced foods and getting in some activity. Love the picture :) He's so cool and relaxed! It's so hard to stay in "health mode" when I am stressed. The first thing I want to do is eat food, and be lazy. BUt you are right, that is so counterproductive. I always have to remind myself that being lazy and eating when I'm not hungry will only cause me more stress, and exercise and healthy foods ALWAYS help! You've spoken truth here. Exercise does give you more energy to get through your way, AND, it's important to realize that sometimes you've just got to slow down. I too thank you for the reminder. I go thru the same thing. and now I am trying to keep BALANCED no matter what life is chucking at me. and I too have to "ease" up when it comes to health and exercise. I think I have been more even keeled lateley and I hope I can continue! I love how the toddler knows how to take care of himself. So intuitive and not messed up by the world telling him what he *should* be doing. Lovely. I think it really takes a conscious effort to take care of yourself in a healthy way. Sometimes when things are tough, I just want to hibernate in front of the TV. But I know I'll feel better if I take care of myself and if I can just get out the door to the gym, I'm all set. 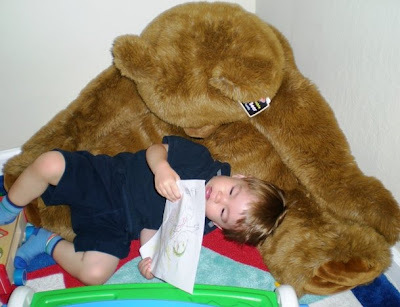 Awww, the toddler is super cute (once again) with that bear towering over him, hee hee! I completely agree with this post. Although eating well and exercising does make a difference in how you feel, it's not the end of the world if you miss a workout or eat Amy's frozen meals. I know I'm going to be super busy once school starts with my new TA job, being a full time student, being involved in church, and blogging ;). I might have to cut down my cardio, cooking time, and blogging :(, but hopefully, it will all work out somehow! Andrea, I am totally in your shoes right now! Life has gotten busy and I've had to slow down in some areas. Blogging being one of them, lol :) Also, like you it is hard for me to realize that it's okay to not have every meal done by scratch especially when there is no time. However, I'm way past due on exercising. Need to just do it! Great post!! There have been times when I've been in a rut. But I always tell myself that tomorrow will be a brighter day. I really do. When I know I have to do something. I force myself to do it because I'll eventually have to get it over with. Delaying the problem won't solve anything. Plus,I try to stay positive. such a good post - i think its so easy to forget to take care of yourself when things get tough, but that's when you need it the most! it can be done - it may require a little work but i think it pays off in the end. thanks for your reminder, and again - your son is TOO. DANG. CUTE. It's like sometimes you almost have to learn to be a kid again and realize there is more to life than whatever is stressing you out. I try to work out often when I am stressed, particularly boxing since it feels good to get it out somewhere. Mostly I end up forgetting to actually eat and that makes me even mroe cranky. So go ahead and take a "time out". I think we all need to be a little easier on ourselves. Sometimes we all need to slow down a bit, and take care of most important things first. I think we have to also be careful, though, to not give up completely on a healthy lifestyle during crazy busy times. Too many people make a healthy lifestyle "all or nothing". There's definitely room for balance. Thanks for a well-written and thought-provoking post! I go thit with some virus and the symptoms never got too bad but i had a fever and slept for 13 hours in a row on Sunday. It was exactly what i needed. I need to take good care of myself and slow it down. what a great pic!!! i try to remember that life is a constant roller coaster - at least, mine has been. when i'm really busy i just do the best i can and rest assured that when things aren't as crazy i can always go "back to normal." It's definitely hard to find that balance between not letting yourself off the hook and not pushing yourself too hard. I struggle with that all the time since I tend to think in extremes. I try to tel myself, "Do what you can." Sounds to me like what you call "taking it easy" would be better eating than most people do. I think you're doing an amazing job. And yes, it is really hard to stay focussed on healthy food when things get hectic and sadly, I have no advice! The only thing that helps me out somewhat is making sure I have decent, easy food in my fridge. I've had busy nights where I call a boiled egg, hummus and veggies and a glass of milk dinner.